We use investor sentiment indicators as contrarian indicators on stock market direction because investors are historically wrong. 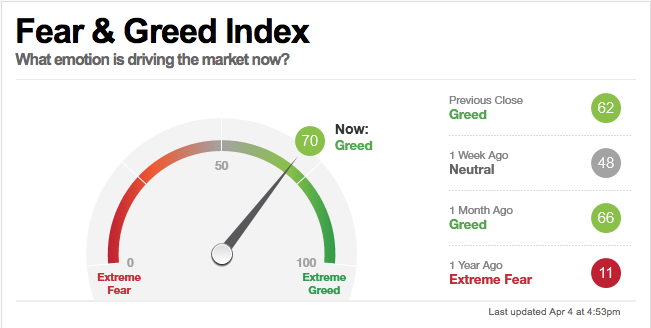 The CNN Fear & Greed Index has moved up to 70, showing short-term sentiment has gotten bullish, a negative sign for the stock market. Meanwhile, the VIX volatility Index is as low as it was before last year’s 4th quarter selloff. Intermediate sentiment also has become more optimistic. The Investors Intelligence Bulls/Bears poll of newsletter market writers is 54% bullish and 19% bearish. That’s a spread of 35% between the two, which is another warning sign. Brad Lamensdorf, the founder and portfolio manager of Active Alts, is a principal and co-manager of the AdvisorShares Ranger Equity Bear ETF. He previously managed a long-short investment partnership from 1998-2005 under the name Tarpon Capital Management. Earlier in his career Mr. Lamensdorf was an equity trader/market strategist for the Bass Brothers’ trading arm. He managed a short only portfolio in addition to co-managing a $1bil hedging program. He also served as in-house market strategist for the entire internal and external network of Bass Brothers money managers.